I havn’t covered Lewisham too often on this blog. 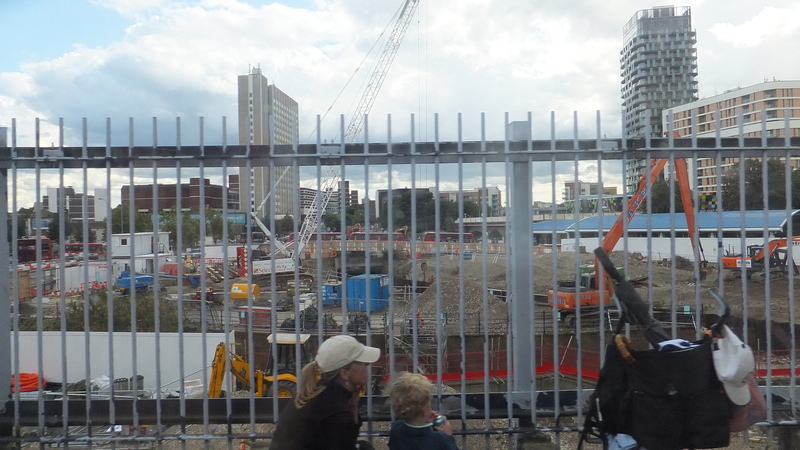 Other great sites such as se13ure have been covering the developments at Lewisham Gateway, which is now in full swing. Passing through on a train shows the many development sites close to the line. 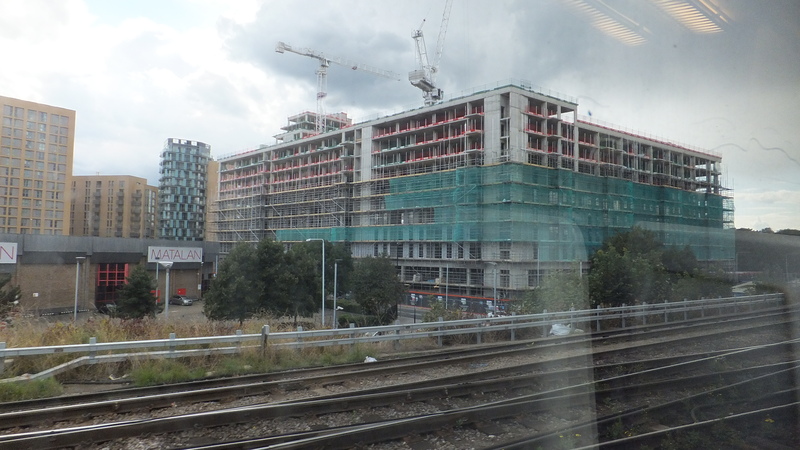 My recent posting about developments along the Greenwich line has inspired me to do a round up of Lewisham developments, as so many are visible from the line. As with the Greenwich line, the many developments will add to the pressure on southeastern rail services in the near future. The rudimentary map on the left shows various development sites across Lewisham, and I will expand upon each individual site below. The mostly completed site is in orange. 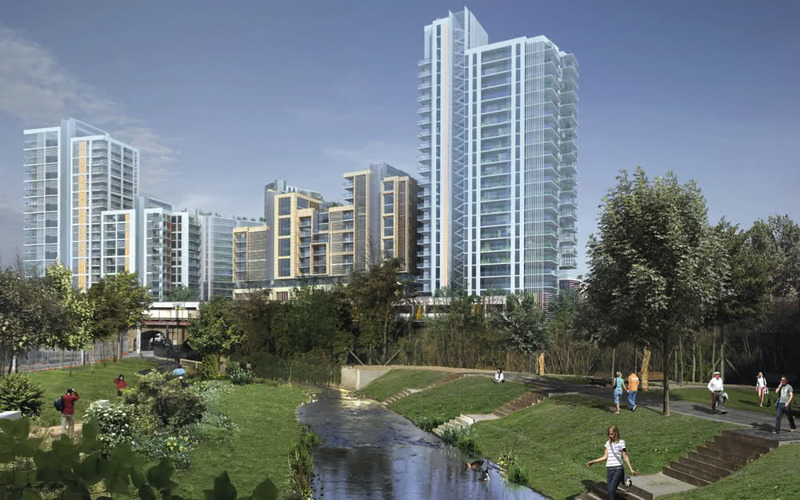 This is the very good Loampit Vale / Renaissance development that includes a leisure centre. Sites now under construction are in red. This includes Thurston Central, Lewisham Gateway, a Premier Inn hotel, 52-54 Thurston Road and Riverdale at the far south. 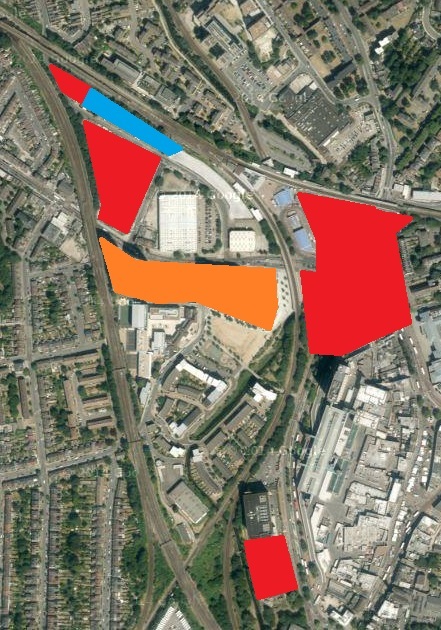 The blue area is a development given approval on an industrial estate, which is still awaiting a start. This block is now very visible on the train to London Bridge from Lewisham. 406 flats are under construction here. This is one serious block and could end up with a monolithic appearance if the cladding is poor. There is also a large retail store included within the development. On the left is a Matalan, and other shops are in that block. 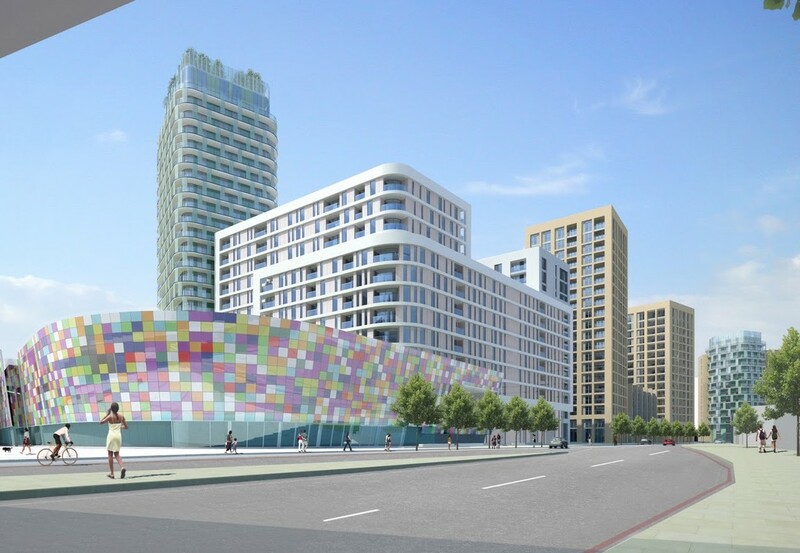 The site is now almost surrounded by new developments, and this site is to include some housing under Lewisham Council’s plans, though no specific proposal has come forward. The current single level store and associated car park is an inefficient use of land so a redevelopment is welcome. Nine long years after consultation begun in 2005 this site has finally begun. Stage 1 has commenced including 193 new homes. A massive worksite has been created which is opening up parts of the river previously covered, and working on the future road layout. The roundabout near the station will be removed. Walking links between the station and town centre should be much improved. Progress can be followed on the Se13ure blog here. 788 new homes in this large Barrett Homes development. I’m not keen on most Barrett’s developments but this is the best I’ve seen from them. It is mostly complete but some buildings are still under construction. I really do like this with the varied towers – some brick and some with blue panels, the varied materials used across the whole development as well as the leisure centre and its lighted tiles. The base of the towers also integrates extremely well at street level with it’s double-height shop frontages. 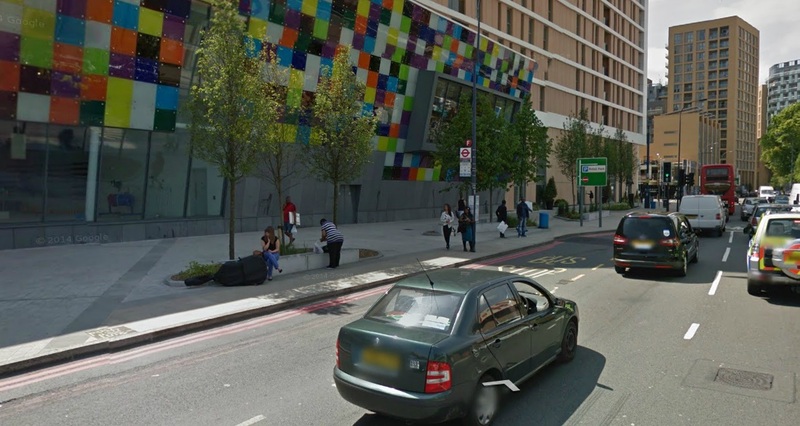 Two issues though – why no segregated cycle lane on the very wide paving here to avoid the extremely congested road? Cyclists must also contend with very busy bus stops. Secondly, have any of the well designed retail units at the base of the towers been let? Last I saw they weren’t, and ludicrous London rents may well be playing a part again here. There are often complaints that these developments just create dormitory towns and that there just aren’t the amenities nearby. High rents often act as a block to independent retailers wishing to give things a go or making a success of things without charging high prices. With reasonable rents units would be let and thrive. We see the problem of empty units in many new developments in London. It isn’t as bad in other UK cities in my experience, where rents are less. Wide paving & no cycle lane. Empty unit. No cycle lane. This is a £200m scheme which has rebranded the area as ‘Central Park’. There were 565 homes on the estates. Over a number of phases 1201 new homes are being built. These are located to the north of Lewisham station past Tesco. The towers with blue cladding have stood out in views of Lewisham for a while now. 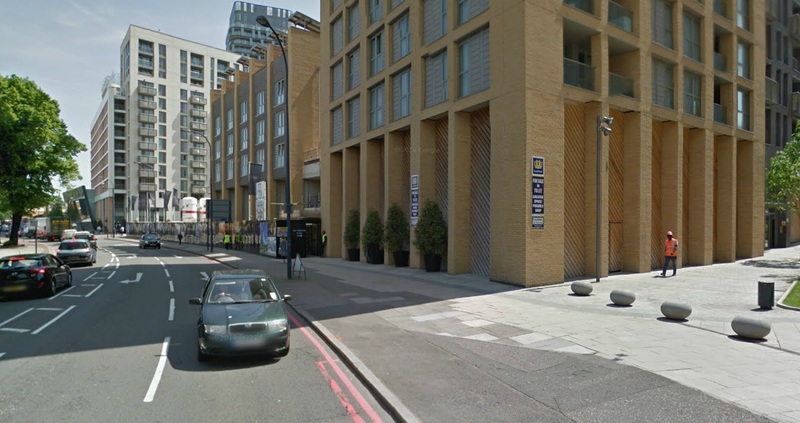 By the way, when looking on streetview at this area I noticed how bad the streetscape was. Not like Lewisham council to be so bad I thought. Then I saw the Greenwich council street signs. Parts of this area are a bit of a Greenwich Council enclave, and based on streetview you can really tell. The usual public realm fails and neglect are evident. Looking around at some of the estates in Lewisham (including some to be demolished) shows a much better streetscape. Even though demolition is imminent they still appeared to be looked after (see image below). You have wooden, low rise fencing by the areas of grass, and not the cheap nasty stainless steel ones Greenwich uses. The concrete housing blocks had red window frames, green garden fences, and decent front doors to soften the effect of the concrete buildings. It appears pretty green and leafy. Not everything looks well maintained but there’s enough nice touches. It looks like some care is given. Here’s another Lewisham estate nearby called Orchard Gardens. Looked after well. Nothing radical or expensive. Just the basics done well. Then there’s the Greenwich council areas a minute away, shown below. Swaths of tarmac which isn’t supposed to be a car park so is a cheap replacement for paving, cheap stainless steel street furniture, the cheapest ugliest bins they could get, a bent street sign and not much greenery to welcome visitors. It all looks miserable. Sure, this is a snapshot of one day on streetview and that sign could have been fixed, but it matches the maintenance standards seen over almost all the borough over such a long period in Greenwich. To be fair, when scrolling along there it isn’t all as bad, but it looks as though the better bits are a legacy of things put in quite a few years ago. There’s many sources of funding they could use to improve areas. The huge amounts of development in the borough have seen millions of section 106 and CIL payments flood in. TfL give millions each year to Greenwich, and improvements to public areas are allowed to be spent from a section of that budget. Other London councils do. There’s the council reserves which have swelled by hundreds of millions in recent years. EU funds may be worth looking into as well for deprived areas. What is needed is an audit to be carried out of EVERY area in the borough, then a department created dedicated to working through improvements. They should gain design input and come up with street guidance plans for departments to adhere to whilst undertaking future work. Easy jobs can be done first, like removing the many examples of broken street furniture, fencing etc and/or any other superfluous clutter. Then replace those that are necessary by removing the cheap & ugly examples of various street furniture with better quality equivalents. Think about how to improve the greenery. After the simple things are done move onto removing or rebuild the more expensive things such as broken walls, raised planters etc which are seen all over. Finally, funding permitting, the big stuff like putting in children’s play areas etc, building exteriors, new facilities such as bin stores, secure cycle storage etc. The first couple of stages would hardly cost a thing as funding is sought for bigger changes. Whoops, I went into another anti-Greenwich moan there. But they get this stuff so wrong so often. Anyway, there’s quite a few more sites under development at this moment in Lewisham, and others that have plans drawn up. There will be a follow up post in the coming days covering these. EDIT : Greenwich are apparently spending £1.6m on refurbishing the Orchard estate in that area. 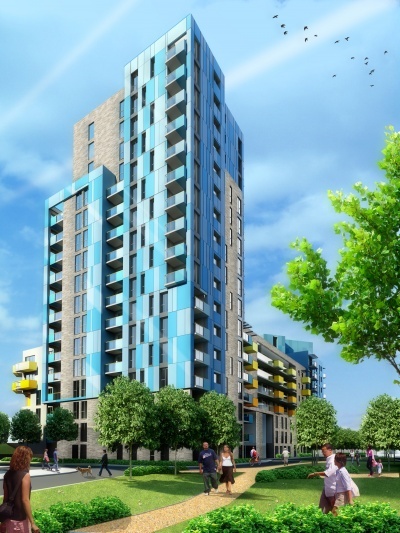 It is very close to the ‘Orchard Gardens’ estate in Lewisham shown above. Very few areas get that treatment (if it involves improving public areas) and I wonder if they were shamed into it by being so close to Lewisham. It could however just be internal work, windows etc which is far more widespread as part of the ‘decent homes’ initiative. If this scheme is above and beyond the work councils are required to do then I welcome Greenwich investing substantially in improvements. But it’s hard to know who or what is being done as there is NOTHING on Greenwich’s website about it. You’d have thought such a large £1.6m scheme would garner a bit of attention. There is a separate story though that £50k was spent on improving communal areas so credit to them for that. The funding was secured from outside bodies DEFRA and SITA, which is the kind of thing Greenwich could benefit from more widely. Add those external funds to the ample revenues they already receive and much could be achieved to improve the borough. Great project! But I still can’t see some results.